In the conventional speed range, the railway noise is composed of contributions from the wheels and the rail. If the track is placed at a steel railway bridges, the bridge structure acts as an additional noise source. For adjacent areas of work, life, learn or recreate, the bridge introduces an annoying noise hotspot. Specific and effective measure are very welcome on the bridge -by avoiding the complete replacement of the whole bridge. If a train passes a bridge, the auxiliary noise source is switched on, which is experienced as a “rumbling” noise. The noise emission is, compared with the already existing rolling noise, more low-frequency – depending on the train type, train speed and the bridge construction. Int these frequency ranges the noise emission is often doubled and therefore assesses as very disturbing. Schrey & Veit bridge dampers VICON SYSA are supporting the acoustical improvement of steel railway bridges. Combination of different metal beams, which are structure-dynamically adjusted to the bridge, are installed on the longitudinal and transverse bridge girders. When the bridge is accelerated by the passing train, the metal beams are also impacted to start their vibration – in turn, this generates a counterforce which is damping the bridge. Measurements on 15 bridges with applied Schrey & Veit bridge dampers VICON SYSA have shown an average sound pressure level reduction of 3 – 6 dB (linear). Caused by to the constructive differences of these bridges, the impact of relevant influence parameters had been assessed. This is an important result for upcoming projects. The following figure shows the principle of the noise emission from steel railway bridges. In general, the main impact comes from the track, is transferred by the sleepers into the bridge structure and emitted as noise in the surrounding air. The steel railway bridge can only be improved when the measure is tuned to the specific bridge vibration behavior. In the initial step, the bridge vibration has to be characterized in detail. Due to the various influence parameters, an on-site measurement of noise and vibration is leading to stable results. From this approach, the real acoustic surrounding is considered in parallel. According national existing measurement specifications, the execution of measurement and analysis can be adjusted. From the analysis results, the Schrey & Veit bridge dampers VICON SYSA can be optimal tuned. Furthermore, this analysis results can be used for a benefit quantification if also measurements after damper installation are executed. In most cases, the Schrey & Veit bridge dampers VICON SYSA can be installed without affecting train traffic. For the measurement and installation only a small area, below the bridge, has to be blocked. Guiding values are two blocking days for measuring and two to six days for installation. An optimal minimization of the bridge noise is achieved by further flanking measures. For example, the rails can be decoupled from the sleepers by special vibration-damping rail pads. The bridge structure is less excited. After that (and partially also at other, unchanged bridged), the rails became the dominating noise source. 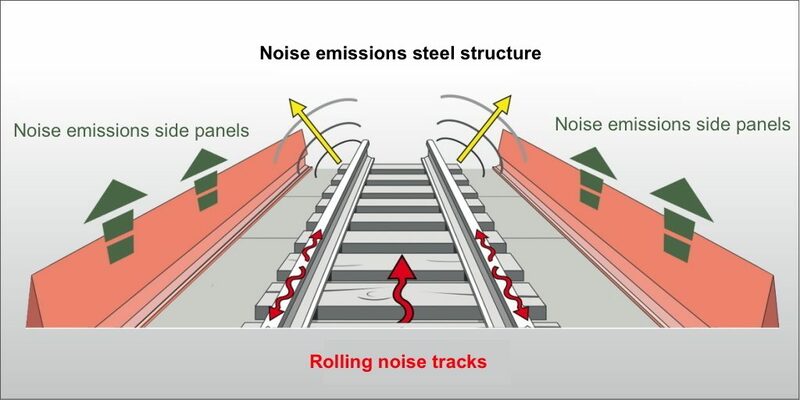 Here, a further noise reduction is achieved by rail dampers.